If you’re looking for a steady stream of pure, unadulterated water, a reverse osmosis system in Downers Grove can be of great use to you. Reverse osmosis systems rid water of almost all contaminants, delivering a taste that is unmatched by all other types of water conditioning systems. However, reverse osmosis systems, like every other mechanical devise, can experience problems. As with all water conditioning systems there are times when service and maintenance may be required. Here are 4 of the most common reverse osmosis system problems. One of the most common problems you’ll run into with a reverse osmosis system is slow water flow. If water is flowing out of your faucet at a much slower pace than it usually does, there is likely something wrong with the system’s storage tank. In all likelihood, your storage tank is not receiving the air pressure that it needs to function. A reverse osmosis system needs to be properly pressurized in order to consistently distribute water. If a leak is sprung in the system’s air bladder, the system will not operate as designed. When it’s empty of water, a reverse osmosis storage tank should possess air pressure of around 7 psi. Perhaps the water coming from your reverse osmosis system has a foul taste or odor? If so, it could be suffering from a variety of problems. The most likely problem is that its filters are worn down and losing functionality. If this is the case, your reverse osmosis system is not filtering water in the way that it’s supposed to. The solution is to change the filters, or to install a new reverse osmosis system entirely. Another possibility is that the water in your reverse osmosis system has been sitting in the storage tank for too long. If this is the case, it’s advised that you flush the system a few times. Another problem that you might run into with a Downers Grove reverse osmosis system is a noisy faucet. Noisy faucets generally occur for two primary reasons. One reason is that the system is new. The other reason is that it has bent tubing. New system noises are common; a result of different components within the system breaking themselves in. They’re not necessarily a problem unless they continue for weeks upon weeks, at which point, it’s recommended that you have a Downers Grove water conditioning specialist come in to check them out. Bent tubing can occur over time for sometimes unexplained reasons. If tubing becomes bent, it will prevent water from flowing consistently. This will often result in annoying noises. Does water continuously run down the drain of your reverse osmosis system? If so, your system is not performing the way it’s supposed to perform. When water continuously runs in this fashion, it’s usually indicative of a broken or malfunctioning valve. Valves are put in place to automatically stop the flow of water at certain levels. When they’re not functioning as they’re designed to function, they will not stop the flow of water, allowing it to continuously fill and spill out of the system’s storage tank. This is problematic in that it results in the loss of substantial amounts of water. 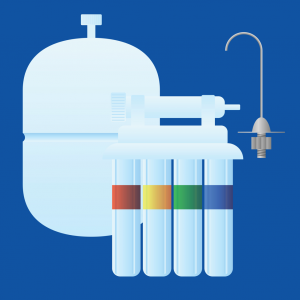 Do you have a reverse osmosis system installed in your home? Is it suffering from any of the problems reviewed above? Looking for professional reverse osmosis system repair in Downers Grove, Illinois? Johnson Water Conditioning has you covered. Our team of water conditioning specialists has extensive experience in the maintenance and repair of reverse osmosis systems. Whether you purchased your system from us or from another company, we can help you to fix it.